Good day, dear reader. 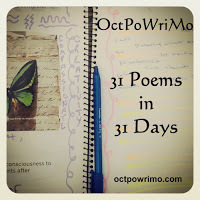 When I saw today's prompt, I immediately knew the subject of my poem for #OctPoWriMo. I cannot imagine penning anything else, until I've written on what my heart tells me to. The prompt is 'handprints'. Now, the prompt is asking us to write about where our handprints have been, what mark have we made. However, I went a different direction. 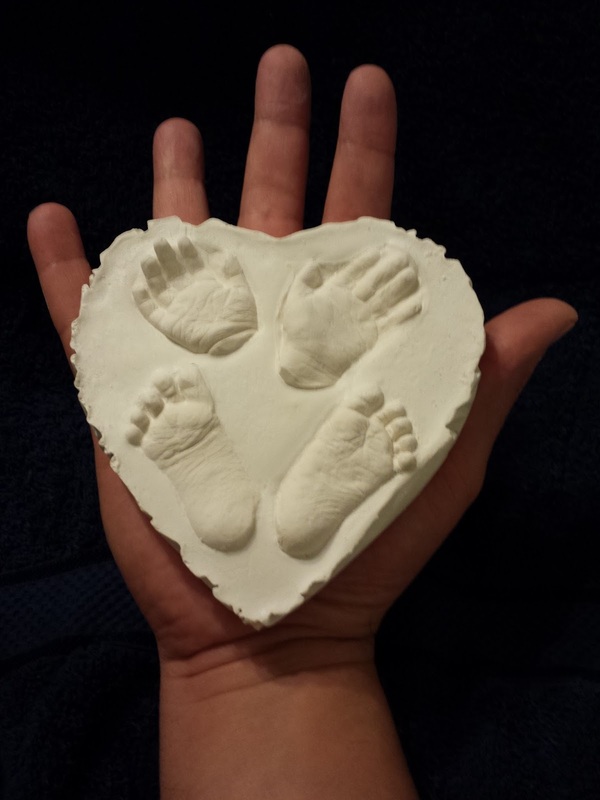 The very first thing that popped into my head was the plaster cast we have of Michael's hands and feet. Michael was our first child. He was taken into the arms of Jesus after 8 weeks of life. I won't tell his whole story here. Suffice it to say that he had his challenges, born 13 weeks premature, weighing 2lbs 1oz at birth with severely under-developed lungs. The image I have shared with the poem is the actual plaster cast of his hands and feet, resting in my hand. Please don't be sad for us. We have great memories of him, we share stories of him with our two children, and we are very secure in our faith, knowing that Michael is in Heaven, and someday, we will join him there. Please enjoy the picture and the poem. That poem was seriously touching, thank you for sharing. Thank you so much for stopping by, Fifi. I really appreciate your feedback! I am crying. This was so beautiful and I think it fits in with the prompt perfectly because your son still left his mark in this world. Small as it might appear at first, he left a big impression in your family's life. My oldest son was 7 weeks early so now you know why I am crying. But my son just turned 18 a few weeks ago. I was so very blessed. When you go back to stalk, check out the birthday post I wrote for him. I really loved this. Thank you so much, Aishah! I just can't get over how touching this poem is. Touched with the expressions..Thank you for sharing a moment you cherished in this beautiful picture. It speaks a thousand words. Thank you, Payal! Much appreciated!! Rod..feel the heart stirring at this end. Your baby is in safe hands wherever he is. Beautiful poem to a beautiful angel. That image is incredible! And your poem is touching, such a haunting fragility to it. And yet I don't feel sad reading it. There's something uplifting hidden in there. Thanks Christine. I am so thankful for that feedback! Beautiful, Rod - you've done a stunning job of taking an incredibly heartbreaking event and turning it into something beautiful - comforting, even - and I love the way YOUR love for Michael shines through it, and your hope that you'll see him again one day. Really beautifully done. Wow. Thank you so much, Lizzi. Thanks for taking the time to read my poem, and for the amazing kind words!! Even if we may understand that life is a precious gift, that doesn't mean it's easy to accept loss. Your poem is so beautiful in evoking that love a parent feels for a child. It speaks to faith and comfort and the courage we need to let go. Thank you so much for your comment, Beth. Without the faith my wife and I have, we'd have nothing. I can write about him happily! Wow, this poem really shines in what I think one of the best ways that art can transform and inspire. Amazingly beautiful ! Thank you ever so much, Raven!! I very much appreciate your feedback. This poem touched me deeply too. Because I helped a friend through those moments, because I have a few little angels who connect with me regularly (or is it I connect with them?). It touched me to my core. Yet I didn't cry, because your poem is one of love and hope rather than one of loss and sadness. Thank you for sharing.